SAN MARCOS – In 1928, a young Lyndon Baines Johnson interrupted his studies at Southwest Texas State Teachers College to accept a fulltime teaching position in the South Texas town of Cotulla. Although his motivation was to earn enough money so he could finish his education, his experience teaching the poverty-stricken fifth and sixth graders at the Welhausen School in Cotulla had a lasting impact on his life. An exhibit that pays tribute to the future President’s year as a teacher in the South Texas town of Cotulla will open at the Lyndon Baines Johnson Museum of San Marcos on Thursday, March 5, 2009. 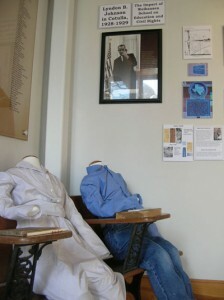 According to museum director Scott Jordan, the exhibit will feature two mannequins wearing typical late 1920s boys’ and girls’ school clothing, posed in an unusual 1920s two-seat school desk donated to the museum by Dr. Gwen Smith of San Marcos, along with photographs, representative artifacts, a 1928 letter from Lyndon to his mother and oral history excerpts relating to President Johnson and his Cotulla students. The clothing that the mannequins will wear was researched and created last summer for the LBJ Museum of San Marcos by graduate historical costuming student Camee Waterson. Waterson patterned the clothing she made after those worn by the youngsters who attended Welhausen School as shown in photographs. She made the shirt for a 10-year-old boy and dress for a 12-year-old girl while she was taking a break from her studies at Louisiana State University in Baton Rouge. Since Lyndon Johnson himself was a young college student at Southwest Texas State when he spent the year teaching in Cotulla, the grade school teaching experience was an important part of his formative years. It would have a lasting impact on him and is an important part of the overall focus of the LBJ Museum of San Marcos. The significance of his year in Cotulla was reinforced when he returned to his alma mater to sign the Higher Education Act of 1965 as he explained how his teaching experience affected his commitment to expanding educational opportunities to all students. Cotulla, the county seat of La Salle County, is located 87 miles southwest of San Antonio and 68 miles north of Laredo, about three-quarters of a mile from the Nueces River. The town was founded in 1881 by Joseph Cotulla, a polish immigrant who donated 120 acres for a townsite to the International-Great Northern Railroad in order to induce them to stop on his land. In 1882 the depot was built and Cotulla sold lots in the new town he modestly named after himself. Coincidently, Joseph Cotulla was the great uncle of long-time San Marcos resident Bill Taylor, retired Upper San Marcos Watershed District administrator and owner of Bill’s Trading Post. The LBJ Museum of San Marcos is open to the public without charge from 1 to 5 p.m. Thursdays, Fridays and Sundays and from10 a.m. to 5 p.m. on Saturdays. Group tours can be arranged on other days as needed. School groups are particularly welcomed. For more information on the Cotulla exhibit or to schedule a tour or an off-site “traveling trunk” visit, contact Scott Jordan at (512) 353-3300 or e-mail him at director@lbjmuseum.com.